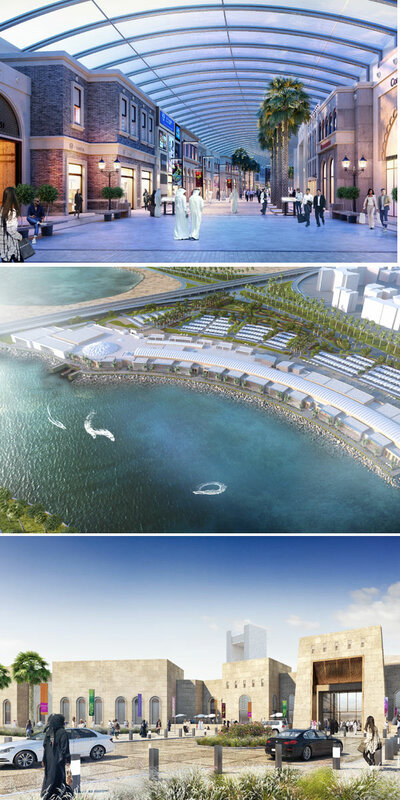 The Avenues – Bahrain, the first commercial and entertainment mall of its kind in the kingdom with a unique seafront location extending 1.5 km, is slated to open in October with 50 per cent of its retail space allocated for restaurants and cafes that will overlook Bahrain Bay. Strategically located in the heart of Manama, adjacent to the King Faisal Road, the 272,000-sq-m development will also boast unique features such as access via water taxis and some 25 per cent of its retail outlets comprising new-to-market brands, said Shuaa Al Qati, communications director of Mabanee, the operator of the mall, while addressing a press conference today (May 9) in Manama. The mall brings a new concept to Bahrain, with a design inspired by The Avenues- Kuwait, and gives visitors an outdoor feeling while remaining indoors, protected from the heat by an ETFE (Ethylene Tetrafluoroethylene) roof, which is a key design feature of the mall. This clear material allows for sunlight to pass through but keeps the heat out, giving a sense of outdoor shopping, stated Al Qati. The project comprises a large family entertainment area, a 12-cinema theatre, as well as an outdoor jogging track, kids play areas, external gym equipment and parking spaces for around 1,500 vehicles. With a leasing space of around 40,000 sq m, The Avenues is expected to completely reinvigorate the area providing a lifestyle venue for the region of Bahrain through 130 new retail outlets. The development is divided into different districts, each with its own unique character, expressed through land use, plan form, architecture and landscape. The Avenues – Bahrain will be home to the first Hilton Bahrain Bay Hotel & Residences with 210 rooms. Residences will have direct access to the mall, making The Avenues- Bahrain an attractive destination for citizens, as well as for tourists and business travellers from the GCC and other countries. The hotel is expected to welcome its first guests in early 2020, stated Al Qati. Most of the stores, he stated, have been leased to local and international brands, including a few newcomers to the region who are set to make their debut in the Bahrain market. These include Urban Decay, The Cheesecake Factory, Bateel, Sephora , Kiehl’s, Riva, Joe’s Café, Batelco, Arabica Coffee, Melenzane ,Café Bazza, Five Guys, Caribou Coffee, Dip n Dip, The Orangery, H&M, Babel and others. Meanwhile, the developers said official approval has been obtained for the construction of Phase Two of the project. This will add another 30,000 sq m in leasing space, as well as new districts.